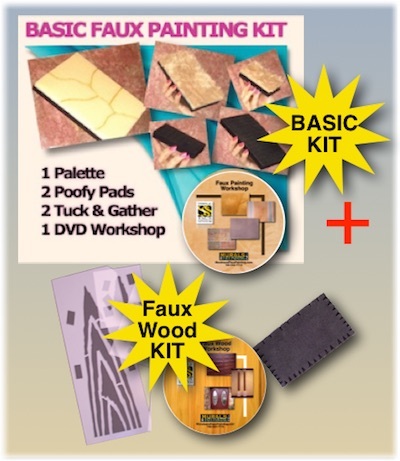 Faux Painting Kit (DVD and 5 tools) PLUS Faux Wood DVD, 2 stencils and wood graining tool and hand painted color swatches to match any paint brand. Save money by buying this combo offer. Learn all the basic faux finishes like Old World, Color Wash, Brick, Stone plus Faux Wood. That's 2 DVDS plus all 10 tools!